The president tweeted that ISIS has been "defeated" in Syria. The Pentagon announced Wednesday that it has started the process of withdrawing all 2,000 U.S. troops from Syria after the White House confirmed President Donald Trump had given the surprise order to leave because ISIS there had been "defeated." President Trump's decision followed a phone call with Turkey's President Recep Tayyip Erdogan last Friday which triggered the decision, a U.S. official told ABC News. During that call, Trump told Erdogan that he was planning to pull U.S. troops out of Syria, a senior Turkish official said. Earlier Wednesday, amid breaking news reports about the withdrawal, Trump tweeted that ISIS has been "defeated" in Syria, saying it was "my only reason for being there during the Trump Presidency." Chief Pentagon spokesperson Dana White said in a statement on Wednesday that the U.S. had "started the process of returning U.S. troops home from Syria." Once officially ordered by Defense Secretary James Mattis, the withdrawal would be completed within 30 days, an official told ABC News. A second U.S. official said the withdrawal would be dependent on the security environment for the American units, so that it's safe for them to leave. Mattis has not yet signed the orders that would trigger the actual withdrawal, those officials said, though they have been drafted by the Joint Staff. The State Department is already beginning to pull out the dozen U.S. diplomats from Syria who were running programs to stabilize areas liberated from ISIS, a third U.S. official told ABC News. 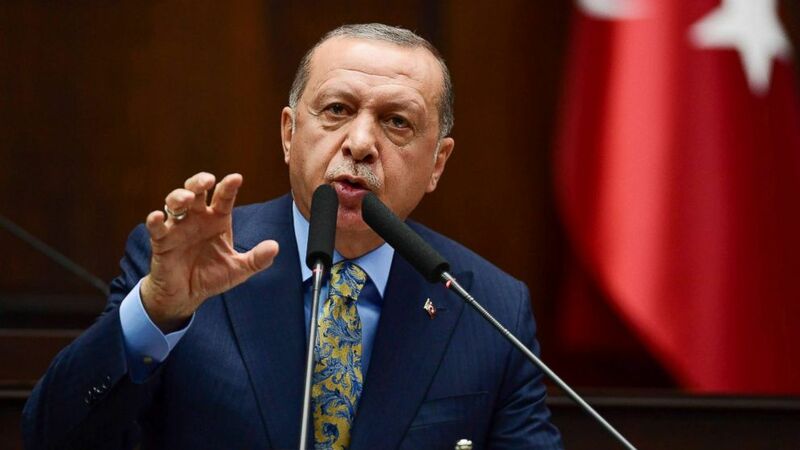 (Getty Images) President Recep Tayyip Erdogan speaks about the murder of Saudi journalist Jamal Khashoggi during his weekly parliamentary address, Oct. 23, 2018, in Ankara, Turkey. Trump's call with Erdogan on Friday followed a week of rising tension with Ankara, including the Turkish leader saying he would launch a military operation against U.S.-backed Kurdish fighters in northeast Syria "within a few days." The third official told ABC News that the call made it clear that Trump never bought into the idea of keeping U.S. troops in Syria, despite officials believing they had convinced him otherwise. While Erdogan and other world leaders such as Israel's Benjamin Netanyahu were alerted to the president's impending decision earlier, some top U.S. officials were unaware until Tuesday. Later on Wednesday, the State Department also announced an intended $3.5 billion sale of the U.S. Patriot missile system to Turkey. There are about 2,000 U.S. troops in eastern Syria advising and assisting the Kurdish-led Syrian Democratic Forces (SDF) in the fight against ISIS. The first U.S. troops arrived in Syria under the Obama administration in October 2015. The original force of 50 U.S. advisers grew to an official level of more than 500, though it actually grew beyond that figure to approximately 2,000 over the following year. 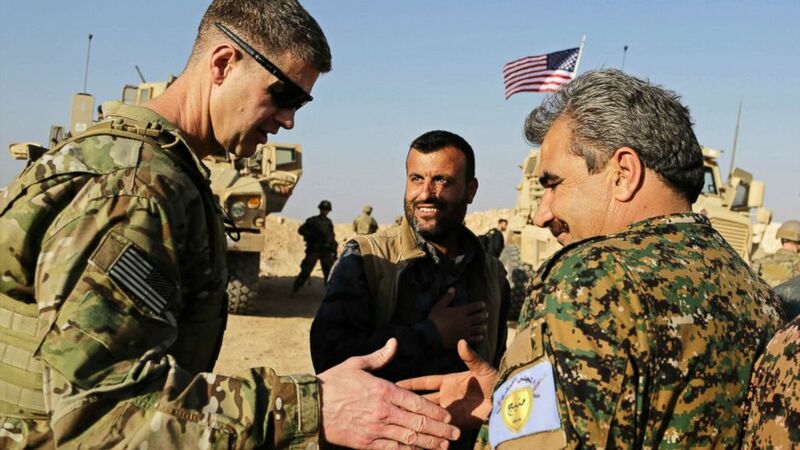 (Susannah George/AP) U.S. Army Maj. Gen. Jamie Jarrard (L), thanks Manbij Military Council commander Muhammed Abu Adeel during a visit to a small outpost near the town of Manbij, northern Syria, Feb. 7, 2018. Lt. Gen. Paul E. Funk, the top U.S. general in the coalition fighting the Islamic State group pledged American troops would remain in the town despite Ankara's demands for a U.S. pullout. Arriving at the Pentagon on Wednesday for meetings with Mattis and other top military officials, Vice President Mike Pence ignored shouted questions from reporters about the possible withdrawal. State Department and Pentagon officials had cautioned as recently as last week that the fight against ISIS is not over -- with the coalition recently estimating that about 2,000 ISIS fighters remain in Syria. "Even as the end of the physical caliphate is clearly now coming into sight, the end of ISIS will be a much more long-term initiative," Brett McGurk, special presidential envoy for the global coalition to defeat ISIS, said at a State Department briefing last week. "We’ve talked about that many times. Nobody working on these issues day to day is complacent. Nobody is declaring a mission accomplished." A Department of Defense spokesperson told ABC News in a statement last Wednesday that "the campaign against ISIS is not over" as U.S. and SDF forces continue offensive operations against ISIS in the Middle Euphrates River Valley near the city of Hajin. "We should not and cannot allow ISIS to breathe at this critical point or we will jeopardize the significant gains we have made alongside our Coalition partners and risk allowing ISIS to resurge," the spokesperson said. One of Trump's usual allies on Capitol Hill, South Carolina Republican Sen. Lindsey Graham, was quick to criticize the president' move as an "Obama-like mistake." “If these media reports are true, it will be an Obama-like mistake made by the Trump Administration. While American patience in confronting radical Islam may wane, the radical Islamists’ passion to kill Americans and our allies never wavers," Graham said in a statement. “An American withdrawal at this time would be a big win for ISIS, Iran, Bashar al Assad of Syria, and Russia. I fear it will lead to devastating consequences for our nation, the region, and throughout the world," Graham said. In March, Trump caught most senior members of his administration off guard when he publicly announced his intention to withdraw U.S. troops from Syria “like, very soon,” sending officials scrambling to square the president’s declaration with U.S. policy. 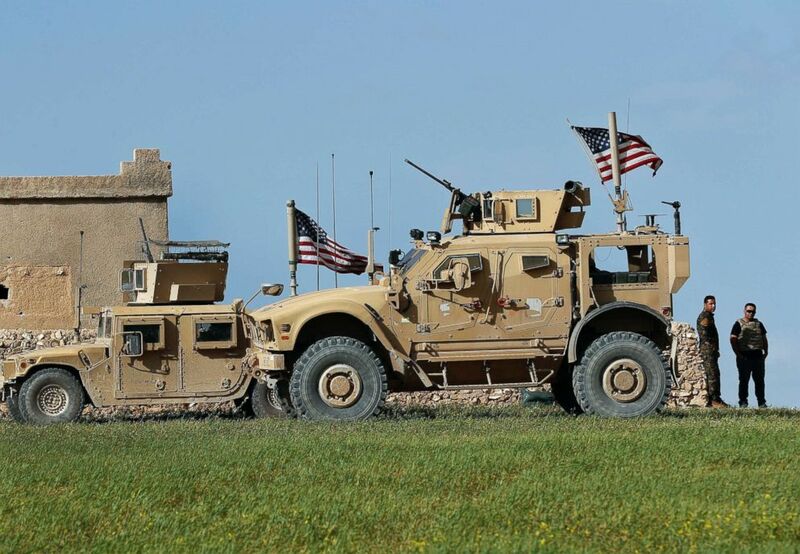 (Hussein Malla/AP) Soldiers of the U.S-backed Syrian Manbij Military Council, a part of the SDF, stand next to a U.S. humvee at a U.S. military outpost on a road leading to the front lines between Syria and Turkish backed fighter,north of Manbij, Syria. Last week during the rising tensions between Washington and Ankara, the Pentagon announced it had established observation posts in northeast Syria near the Turkish border because the U.S. wanted to warn the Turks of individuals moving in that area, namely Kurdish fighters who belong to a force that Turkey considers to be an element of a terrorist group. But some of those Kurdish fighters also serve in the U.S.-backed SDF. In the past, skirmishes between Turkey and the Kurds along the Turkish-Syrian border drew Kurdish fighters away from the final offensive against ISIS, even causing the U.S.-backed fighting force to suspend their operations for a short time. "The argument can be made that -- by leaving Syria -- we have placed our allies, the Kurds, at greater risk of being targeted by Turkey," said ABC News contributor John Cohen, the former acting undersecretary for intelligence and a former counterterrorism coordinator at the Department of Homeland Security. In addition to Trump telling Erdogan he was going to pull U.S. troops out of Syria, the two leaders also spoke about Turkey's security concerns there, according to a readout of that conversation the White House released on Friday. "The Presidents agreed to continue coordinating to achieve our respective security objectives in Syria," the readout continued. ABC News' Rym Momtaz, Alexander Mallin, and Mariam Khan contributed to this report.